Hundreds gathered last Thursday -- some waiting overnight -- at Video & Audio Center in sunny Lawndale, California (which, the Mayor reminded everyone is NOT Torrance) for the official launch of the first Ultra-High-Definition television available in the US market. The 84-inch television, model 84LM9600, is an LED TV with a "4K" 3840 x 2160 screen resolution. At eight million pixels, that's four times the pixel count and resolution of current "Full HD" 1080p televisions. The 48LM9600 includes LG's Magic Remote for hand gesture and voice control, is 3D capable using passive glasses and, as one of LG's Smart TVs, comes equipped with apps and access to streaming audio and video content. But "wait a minute," you may be asking yourselves. They have 4K digital projectors in commercial cinemas, but is there any home entertainment -- broadcast, streaming, download, physical media -- available today in the new Ultra-HD standard? That depends. There are a few 4K DSLR cameras and video recording devices, so if you're a budding filmmaker or a home-movie enthusiast, you could watch your own content on the Ultra-HD TV. However, in terms of professionally produced product -- Hollywood films, television series, and video games -- you're currently limited to Blu-ray's 1080p content. But fret not, my friends, LG has you covered with its proprietary up-conversion engine (this TV has two dual-core processors built-in), the "LG Resolution Upscaler Plus," which automatically up-coverts all of your content to 3840 x 2160. I didn't get to check a variety of sources in person, but after watching the in-store demo loop over and over again (the source, according to LG: an LG Blu-ray player), and it looked stunning. Jaw-dropping even. Most of the footage was from HD time lapse photography -- famous landmarks like the Eiffel Tower, beautiful desert canyons, rolling clouds in clear blue skies, starscapes swimming across the horizon. You've seen this material before, and I would have sworn LG hooked up a 4K source. Other than some light banding seen at an unfair distance of 12-24 inches, which I'm guessing is in the source material or Blu-ray encode, the Ultra-HD TV was mesmerizing. Though, to be fair, ever other 1080p HDTV in the store wasn't running the demo loop so there wasn't a chance to compare and contrast it with the best LEDs and Plasmas from LG and competing brands, but still the demo was breathtaking. For what it's worth, LG claims the LG Resolution Upscaler Plus will work with SD footage as well, but I didn't get to see that first hand. My guess is results would vary depending on the source quality and viewing distance. So how much will you have to pay to be among the world's first to own a 4K display and is it even worth it? *No “ultra high definition” or “4K” video content is currently available. No broadcast or other standard currently exists for “4K” or “ultra high definition” television, and the 84LM9600 may or may not be compatible with such standards if and when developed. Remember all those early adopters who had DVI or RGB component HD inputs on their "HDTVs" who ran into limitations when HDMI arrived on the scene? The risk here is that you'll be stuck with a next-generation TV that can't actually play next-generation content. But then again, if you're in the market for an 84-inch television, having four-times the pixels is certainly a benefit much like having a high quality computer monitor -- Retina Display or other -- where everything on your computer looks better, even 720p and 1080p content. ‘ULTRA-HIGH-DEFINITION’ 4K TVs IN U.S.
LOS ANGELES, Oct. 25, 2012 – Ushering in a new era in home entertainment, the first “Ultra High Definition” flat-panel TV – with four times the resolution of today’s HDTVs – went on sale today to consumers in the United States. LG Electronics USA chose Southern California, the epicenter of entertainment and innovation, as the consumer launchpad for this groundbreaking technology. 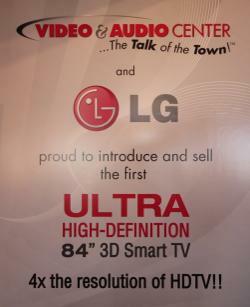 Teaming up with high-end retailer Video & Audio Center, LG hosted hundreds of consumers eager to be among the first in the United States to have an opportunity to see and purchase LG’s new Ultra HD TV. The LG 84-inch class (84-inch diagonal) LED TV, with a native Ultra High Def screen resolution of 3840 x 2160 to match its impressive size*, has an MSRP of $19,999.99. Model 84LM9600 quadruples the level of detail from full 1080p HD resolution to a massive 8 million pixels. Even before so-called “4K” content is available, LG’s powerful up-conversion engine, the proprietary “LG Resolution Upscaler Plus,” delivers higher detail from current HD/SD external sources. On hand at Video & Audio Center’s Lawndale/Torrance, Calif. store today to discuss the importance of Ultra HD’s development and its expected market adoption were industry luminaries, including Jeff Joseph of the Consumer Electronics Association (CEA); Randall Dark, an award winning director and 4K content pioneer; and industry insider and technologist Tom Campbell. In addition to its excellent picture quality, LG’s 84LM9600 boasts a growing Smart TV ecosystem, which is composed of over 1,000 apps and gives users access to a growing range of premium content services**. Users can easily browse and navigate through the Smart TV ecosystem using LG’s Magic Remote, which allows users to make commands using the control modes of Voice Recognition, Wheel, Magic Gesture and Point. It also features LG’s CINEMA 3D technology and an imbedded 2D to 3D conversion engine expanding 3D content availability. For more information on LG’s Ultra HD TV please visit, https://www.lg.com/us/tvs/lg-84LM9600-led-tv. **Internet connection and certain subscriptions required and sold separately. Content and services vary by product and are subject to change without notice. For a small percentage of the population, the viewing of stereoscopic 3D video may cause discomfort such as dizziness or nausea. If you experience any of these symptoms, discontinue using the 3D functionality and contact your health care provider. Designs, features and specifications subject to change without notice. LG LED TVs are LCD TVs with LED backlighting. About LG Electronics USA, Inc.
LG Electronics USA, Inc., based in Englewood Cliffs, N.J., is the North American subsidiary of LG Electronics, Inc., a $49 billion global force and technology leader in consumer electronics, home appliances and mobile communications. In the United States, LG Electronics sells a range of stylish and innovative home entertainment products, mobile phones, home appliances, commercial displays, air conditioning systems and energy solutions, all under LG’s “Life’s Good” marketing theme. LG Electronics is a 2012 ENERGY STAR Partner of the Year. For more information, please visit www.lg.com.